A piglet born four weeks ago without usable back legs has learned to walk on his front legs. 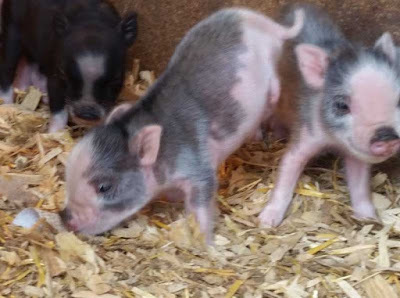 "To get around, I noticed he was kind of tripoding - walking on his front legs and putting his nose on the ground to steady himself," said Ari Smith, the founder of Colorado Cutie Pigs. "Now he just balances on front legs. He’ll run. It’s pretty cool." Miracle was one of six pigs in a litter. YouTube link. YouTube video of Miracle when he was just a week old. "Normally if there's anything wrong with a pig, the mom will abandon it and not take care for it," Smith said. But in this case, mom didn't abandon Miracle and cared for him just like his siblings. "He’s seems totally fine," says Smith. "He’s gained weight, he gets around with his siblings.